¶ Isolated boulder fields attributed to the last glacial maximum (LGM) contain boulders with corners rounded off by tumbling that are many boulders deep, pointing to a catastrophic origin in discrete debris flows. Moreover, many of the boulders exhibit deeply-incised surface features, such as cup marks and striations, that appear to have formed by abrasive scouring, similar to sand blasting, which points to a high-velocity catastrophic origin. These discrete, isolated boulder fields are suggested here to have the same catastrophic origin as Carolina bays, designated, Younger Dryas (YD) impact boulder fields. ¶ Carolina bays and YD impact boulder fields are suggested to be secondary impacts of fragments of Laurentide ice sheet launched into multi-thousand kilometer ballistic trajectories by a primary YD bolide impact on the Laurentide ice sheet in the Great Lakes region, circa 12,900 B.P. ¶ An Younger Dryas (YD) impact or airburst, circa 12,900 B.P., has been all but proved with the discovery of a platinum spike in the Greenland ice sheet, with only the size and location of the bolide impact or impacts open to question. Additionally, a thin layer of magnetic grains, microspherules, nanodiamonds, and glass-like carbon have been unearthed at various locations across North America, Europe and beyond, generally overlain by a ‘black mat’, with a high carbon content. The black mat is nearly coincident with megafauna extinction in North America and the disappearance of the Clovis civilization (Firestone et al., 2007; Firestone, 2011). ¶ An impact hypothesis for large, shallow oval depressions, known as Carolina bays, originated in the 1940s. Carolina bays are a series of 500,000 oval depressions that range in size from 50 m to 10 km in length that are concentrated along the Atlantic seaboard and the coastal plain of the Gulf of Mexico. An alternative secondary impact theory was advanced in the 21st century, suggesting a secondary impact origin. The long axes of the Carolina bays point back to a suggested primary bolide impact on the former Laurentide ice sheet in the Great Lakes region that apparently lofted giant chunks of ice sheet (icebergs) into ballistic trajectories of 1000s of kilometers to form elongated secondary-impact craters, when and where they landed on soft waterlogged soil, most prominently along the coastal planes. ¶ If iceberg trajectories were at all isotropic in orientation, then the inland was similarly impacted as the coastline, but apparently with less long-lasting effect. Iceberg impacts on the thin soil of upland terrain may have brecciated a layer of bedrock, but without sufficient energy to sculpt the resulting boulders into an elongated Carolina bay-like craters with raised rims. Then 13,000 years of sedimentation over in situ bedrock brecciation may have more or less visually obscured the damage. ¶ The outcome may have been different on sloped ground, however, where gravity could concentrate brecciated boulders in a dynamic debris flow into a discrete, impact boulder field, downhill from the iceberg impact. ¶ Isolated Pennsylvania boulder fields are classically attributed to a periglacial freeze-thaw process during the Last Glacial Maximum (LGM), where frost action fractured bedrock and the boulders gradually creeped downhill by ‘solifluction’, where frozen subsoil acted as a barrier to the percolation of water, creating a wet surface over a frozen subsurface during thaw cycles. ¶ Solifluction describes a permafrost setting in which subsoil remains permanently frozen, creating a barrier to the downward percolation of surface water into the water table. Thus surface moisture saturates the thawed topsoil, creating a greasy lubricant over a slippery frozen subsurface for sliding boulders downhill. And periglacial freeze-thaw cycles are presumed to promote the fracturing solid bedrock into mobile boulders by the expansive force of freezing water, where refreezing after thawing has the effect on rock of hammering on a log-splitting wedge into a log. ¶ Alternatively, a catastrophic impact debris-flow origin makes different predictions. Catastrophic impact fracturing should differ from the types of joints (fractures) that appear naturally by physical weathering; however, this level of discrimination would require an advanced understanding of rock fracturing mechanics far beyond the scope of this write-up. Additionally, a catastrophic debris-flow concentration of boulders can better explain corner rounding of boulders during to tumbling, compared to gradual sliding during solifluction conditions. And a rapid debris flow can better explain the jumbling of boulders into deep boulder fields, many boulders deep. Finally, a super-high velocity ice impact sufficient to fracture bedrock would be expected to create characteristic surficial damage on impact-fractured boulders, telegraphing their catastrophic origin. 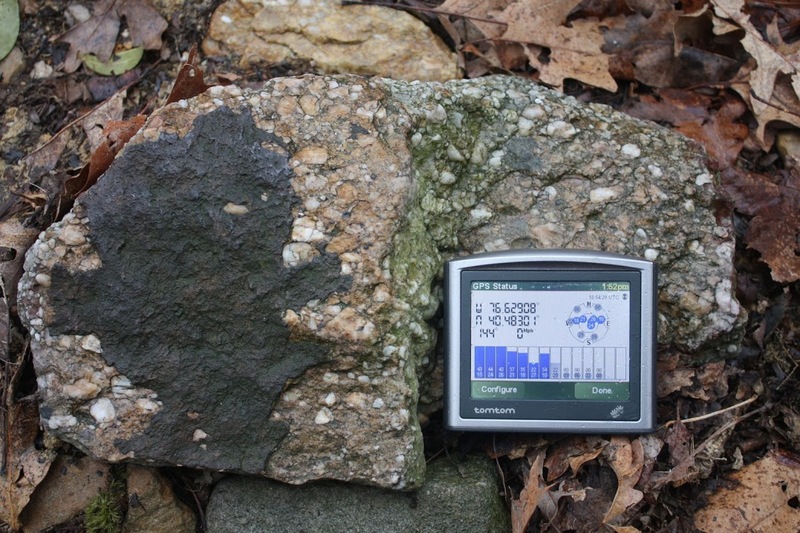 Next we examine several discrete boulder fields in Southeastern Pennsylvania. 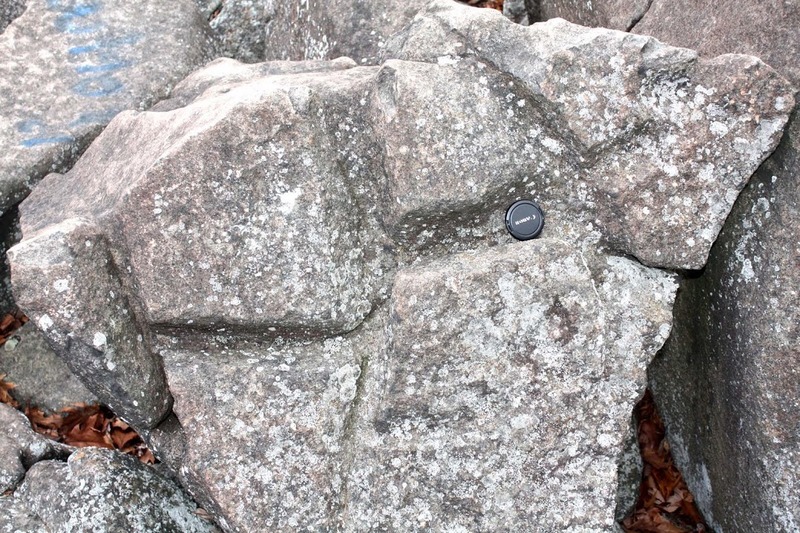 ¶ The smaller and less well known of the two Ringing Rocks boulder fields is in Pottstown, PA (40.270647, -75.605616), which exhibits larger diabase boulders with sharper subchoroidal fractured corners, with less corner rounding due to less tumbling. 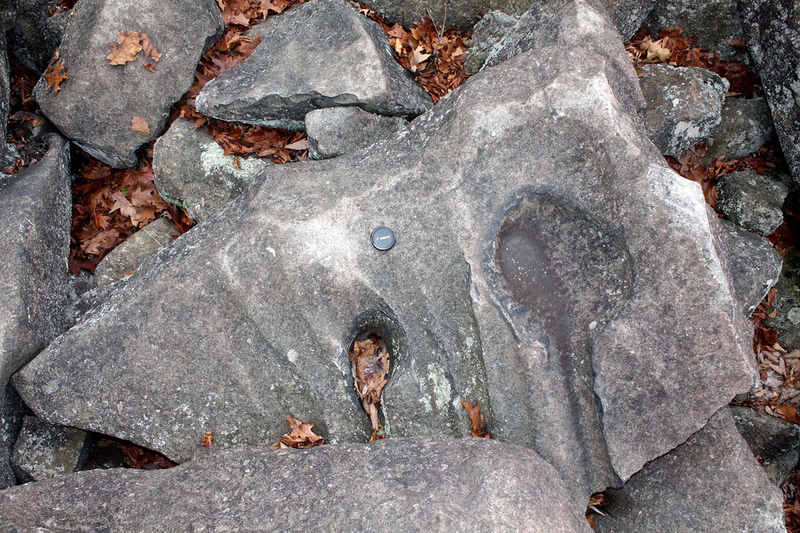 The larger Ringing Rocks boulder field is in Lower Black Eddy, PA (40.562546, -75.129578). ¶ Triassic diabase of the Central Atlantic magmatic province (CAMP) provided a particularly tough target rock to secondary iceberg impacts, with many boulders exhibiting sharp subconchoidal fractures. 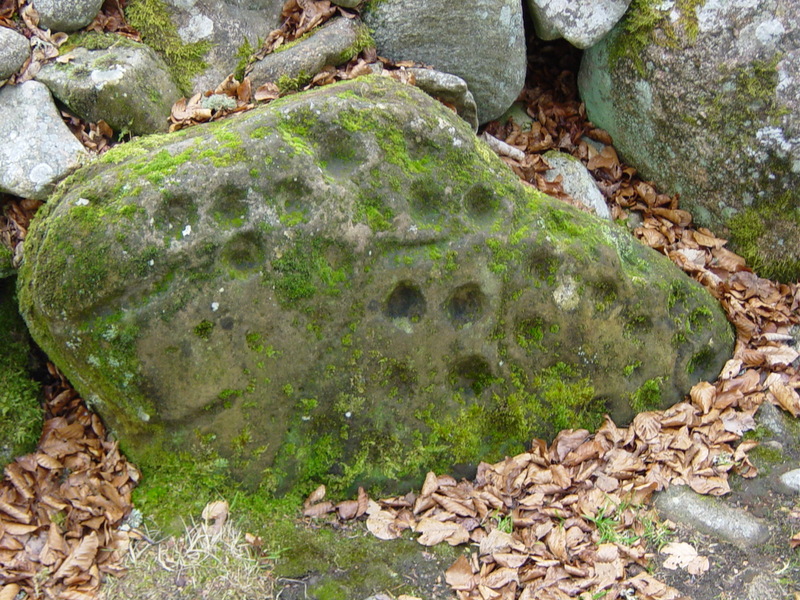 Heavily-weathered diabase boulders outside these discrete boulder fields typically exhibit rounded surfaces, caused by slow spheroidal exfoliation, with less-rounded joints between adjacent boulders that have ‘recently’ split, and have not yet had time to undergo spheroidal exfoliation. Devil’s Den in Gettysburg, PA is characteristic of in situ physical and chemical weathering of a diabase seam that’s more resistant to erosion than the surrounding terrain, causing the diabase to stand out in relief as an exposed ridge. While porous sandstone should be far-more susceptible to freeze-thaw cracking than tough non-porous diabase, the very toughness of diabase results in exposed diabase ridges, which would have been more exposed to freeze-thaw cracking than adjacent subsurface bedrock that likely would have remained frozen year round, so periglacial brecciation can not be dismissed out of hand, but Ringing Rocks boulders exhibit two unusual properties that are more easily explained in a catastrophic context, namely a ‘ringing’ quality and deeply-incised surface features. ¶ The diabase boulders within the two Ringing Rocks boulder fields exhibit an unusual acoustic property, where many boulders ring like a bell when struck sharply with a hammer or other hard object, hence the name, ‘Ringing Rocks’. Diabase boulders outside these two discrete boulder fields do not exhibit this acoustic property. Presumably super-high pressures to which the boulders were subjected prestressed the surfaces, imparting capacity to resonant. ¶ Diabase weathers slowly and predictably, first attaining a rust-like patina, followed by forming a brown-orange rind, which ultimately exfoliates to expose unweathered rock underneath. 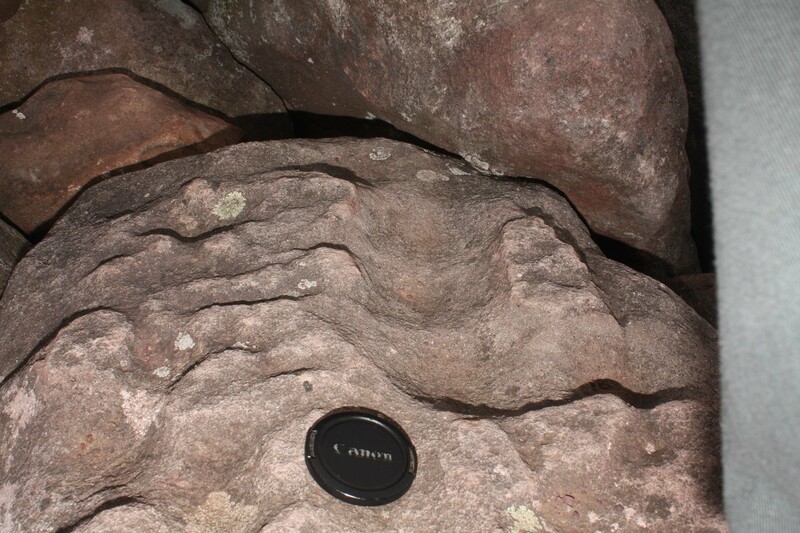 And like granite, diabase tends to undergo spherical exfoliation to form rounded boulders. In the two Ringing Rocks diabase boulder fields, weathering has barely progressed beyond forming a rust-like patina on the exposed boulders, and indeed the Ringing Rocks boulder field in Lower Black Eddy, PA is recognized to date to around the Last Glacial Maxima, therefore deeply incised surface features, discussed in the following section, can not be dismissed as Holocene weathering and are strong evidence of a catastrophic origin. 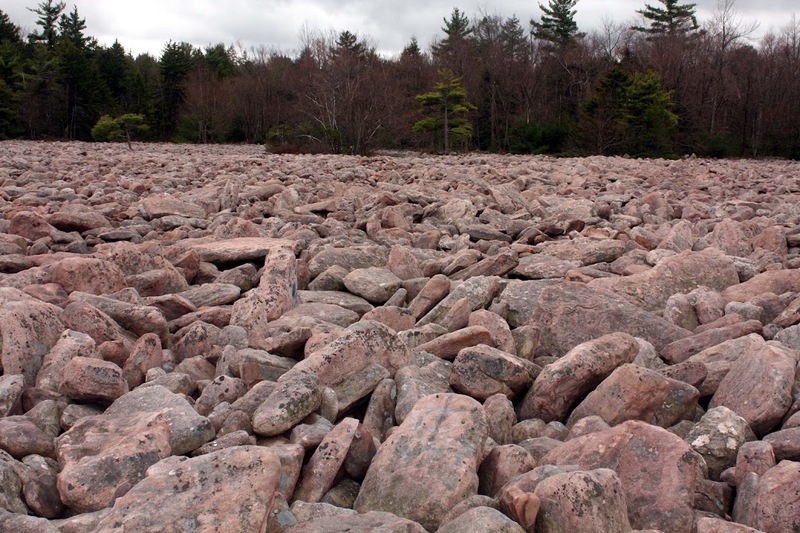 ¶ The pink boulders of the Hickory Run boulder field are presumably Devonian sandstone from the Catskill Fm, Duncannon Member. The sandstone sand-grain size appears to be inversely related to boulder size, which suggests that in the upward-fining cycle, fine-grained sandstone was at the surface, which was brecciated into smaller boulders than the underlying sandstone with coarser sand-grain size. While finer-grained sandstone will naturally take a higher polish than coarser-grained sandstone from tumbling, the difference in roughness between large and small boulders seems exaggerated, with many of the smooth smaller boulders appearing to have a chemically indurated surface. In vibration or tumbling, larger objects rise to the surface, such that the larger boulders rode over the smaller boulders underneath causing the smaller boulders to receive more abrasion. Then, perhaps, the muddy matrix indurated the surfaces of the smaller boulders in the form of crystallization from saturated mineral species. Finally, the sandy-muddy matrix washed away through the porous French drain of the boulder field, revealing the polished and indurated smaller boulders. ¶ Curiously, the terminal moraine of the Wisconsin glaciation appears to surround the Hickory Run boulder field in a semicircular ring of more than 180° from west-southwest to due east. ¶ Hickory Run boulder field is much larger than either of the two Ringing Rocks boulder fields, and consequently its boulders are considerably more rounded due to a greater degree of tumbling, and perhaps also partly due to sandstone being a brittler composition than diabase. 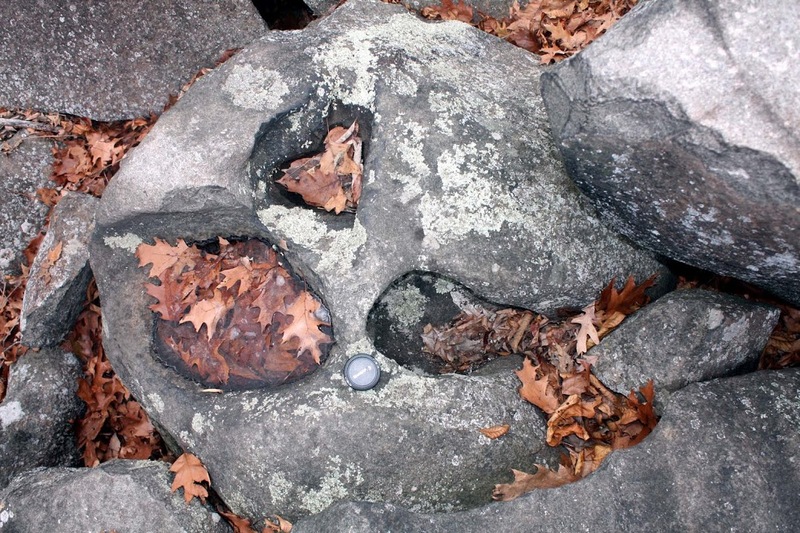 ¶ Hickory Run boulders also exhibit deeply-incised surface features, but the tougher, less tumbled Ringing Rocks boulder fields more faithfully preserved the features. ¶ An official signpost at the Blue Rock boulder field attributes its formation to periglacial mechanisms. 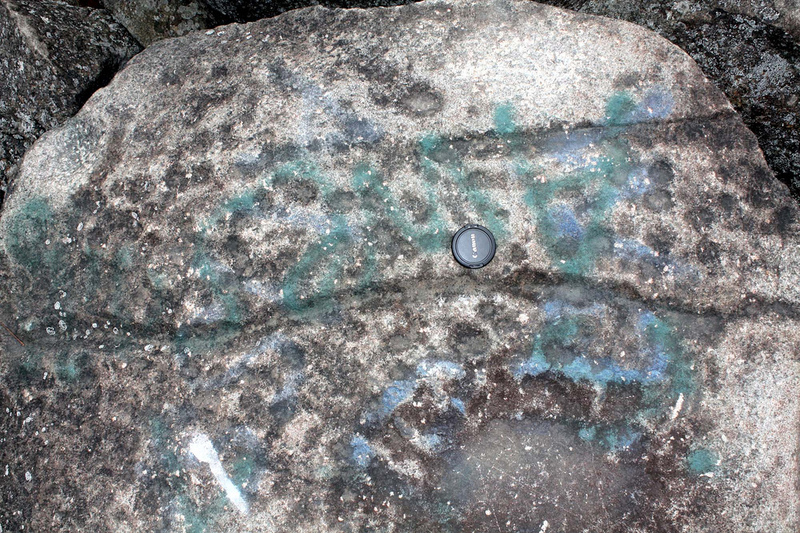 If the heavily weathered Tuscarora quartzite boulders of Blue Rock boulder field (40.592022, -75915160) at Hawk Mountain, PA received deeply-incised surface features similar to the Ringing Rocks and Hickory Run boulders, these surface features have apparently eroded away. ¶ The Blue Rock boulder spills down the south southeast side of Hawk Mountain, which means that a ballistic iceberg impact from the the west-northwest (Great Lakes region) impacted the surface at a particularly oblique angle, such that its downhill momentum likely contributed materially to creating a debris flow. So while a ballistic iceberg is less likely to impact on the far side of a hill or mountain, a consequent far side impact may have been much more likely to create the debris flow necessary to form a boulder field. ¶ Discrete YD impact boulder fields that are relatively-free of vegetation are conspicuous on Google Maps, satellite mode, but they should not be confused with talus slopes below steep terrain that form by gradualism. ¶ Boulder fields are relatively rare compared to the 500,000 Carolina bays, such that highly-prominent boulder fields must be only the tip of the iceberg. ¶ Three of the four Boulder field boulders examined exhibit a high incidence of incised surface features, which were presumably caused by abrasive scouring by super-high-velocity water or steam, from ballistic iceberg ice, flash melted and vaporized upon impact. The incised surface features typically take the form of pock marks or pits (elsewhere called ‘cup marks’), as well as linear striations and pot holes, where pot holes are defined here as deep pits, often with flat bottoms shaped like a pan, with associated ‘handle’ striations. ¶ Ballistic icebergs impacted at several kilometers per second with a seismic impulse that cracked the target bedrock, like slamming a flagstone with a sledge hammer. Additionally, the ice flash melted into water, scouring out surface features of exposed bedrock and forcing open preexisting cracks and crevices, like pounding a splitting wedge into a log. ¶ ‘Cup marks’ on boulders and exposed bedrock are well known in Europe, where they’re presumed to be a form of prehistoric art. Indeed, some cup marks are circumscribed by concentric rings that are very evidently man made, although the original cup marks could still be natural secondary-impact products. By comparison, incised surface features on boulder field boulders in North America are ignored by both geologists and archeologists. ¶ Ring art around what could be naturally-incised cup marks in this IMAGE from Fowberry Cairn, UK. 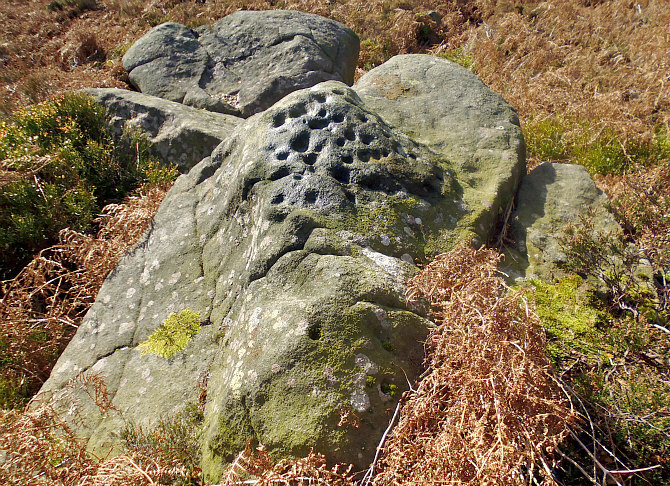 ¶ Presumably only the cup-marked top portion of the rock was exposed above the soil line at the time of a local iceberg impact, in this IMAGE from Farnhill Moor, UK. 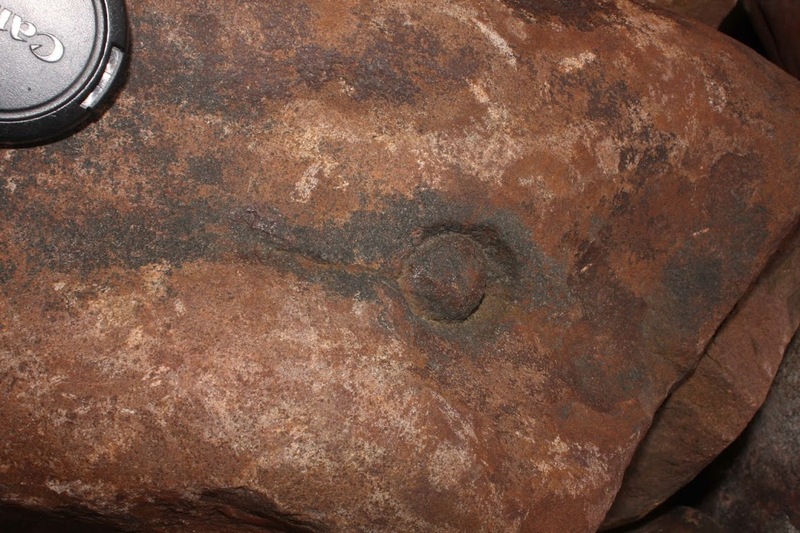 ¶ Note the distinct pitting in the largest cup mark on the right side of the image, composed of different diameter pits. Perhaps this pitting could be fabricated by hammering on various-sized star drills and chisels, but in combination with the smaller cup marks and meandering striations, the total effect appears to be more random than artistic. ¶ Dark-brown, nodular, ferromagnetic rock scale on bedrock, cobbles and boulders is suggested here to be (YD) ‘impact spatter’, when iron ore is not locally present, although ideally, rocks with dark-brown nodular rock scale would be discovered on stones at the bottom of well-dated black mats. Black mats, however, formed in submerged low lying areas that concentrated extraterrestrial material terrestrial charcoal by run off, whereas bedrocks, cobbles and boulders coated with impact splatter from a nearby iceberg impact would be unlikely to find their way into the future black mats. 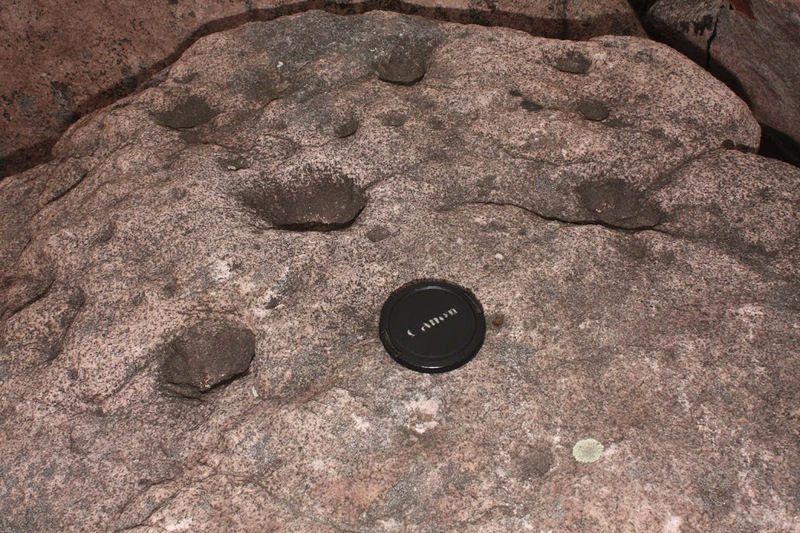 Suggested impact splatter has not been found on boulders within any of the four suggested impact boulder fields, where perhaps adhered extraterrestrial material would tend to have been ‘steam cleaned’ off the boulders by super-high pressure and velocity steam and water. ¶ Impact spatter presumes high velocity coating of target rocks by ‘sticky’ extraterrestrial material that remains adhered to the surfaces after almost 13,000 years. Presumably extraterrestrial material arrived by way of ballistic iceberg, whereupon tertiary spattering could have covered a vastly larger footprint than the iceberg impact footprint itself. Considering the (500,000) Carolina bay density, perhaps nowhere within several thousand kilometers of the primary impact on the Laurentide ice sheet near the Great Lakes was safe from tertiary splattering. ¶ This type of nodular impact splatter is conspicuously present on ‘one side only’ of boulders and cobbles, apparently coating only the side of the rock exposed to the incoming (tertiary) impact splatter. 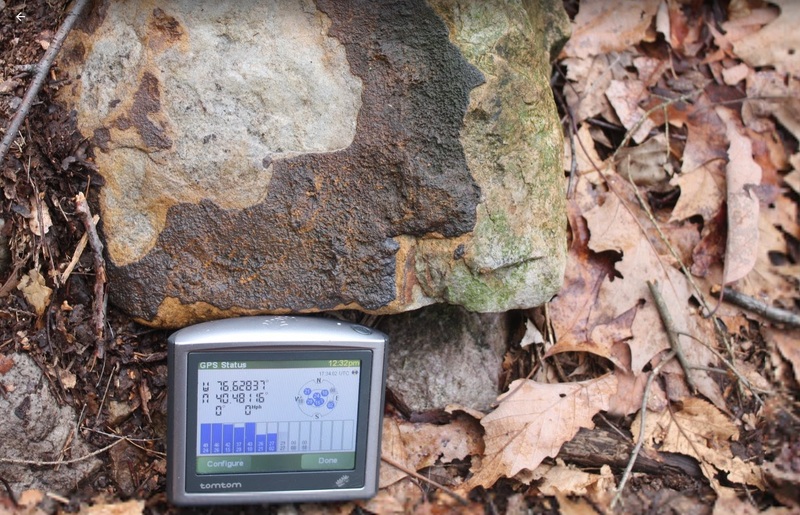 ¶ The following two images show nodular rock scale on Devonian conglomerate and sandstone on Stony Mountain, north of Fort Indiantown Gap, PA. Stony Mountain is covered with boulders, giving the mountain its name, suggesting the possibility of the mountain being ground zero of a large secondary impact that did not create a discrete boulder field. 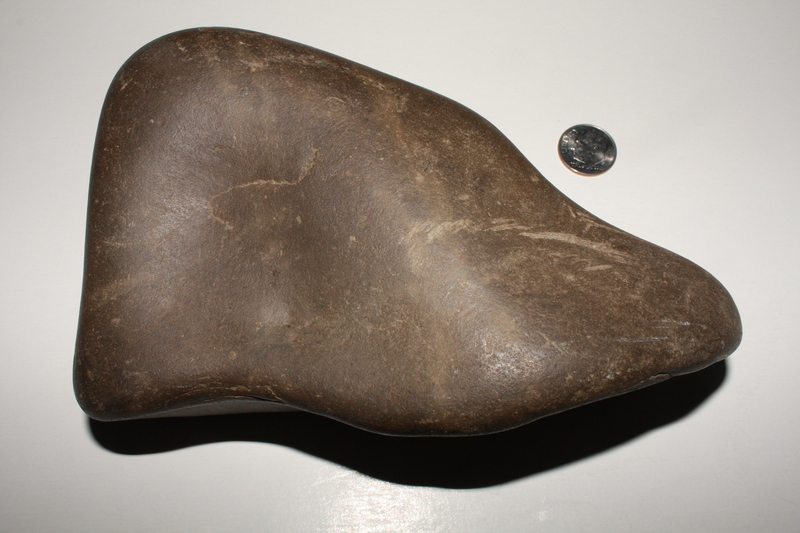 ¶ The greywacke ‘shoe stone’ from the Susquehanna River, Millersburg, PA exhibits millimeter-scale nodules on one side only (left side and bottom). 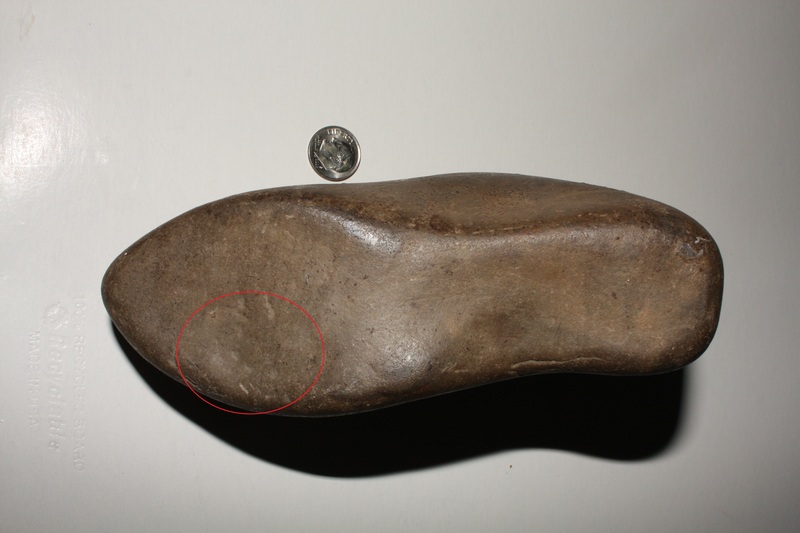 One small area on the sole, circled in red, exhibits apparent human modification, presumably to more closely resemble a human shoe or moccasin. If the nodular rock scale is indeed YD impact splatter, then its presence at the surface 12,900 years ago raises the probability that the sole modification was Clovis, perhaps as a child-sized moccasin last, or as a child’s plaything. (Clovis?) 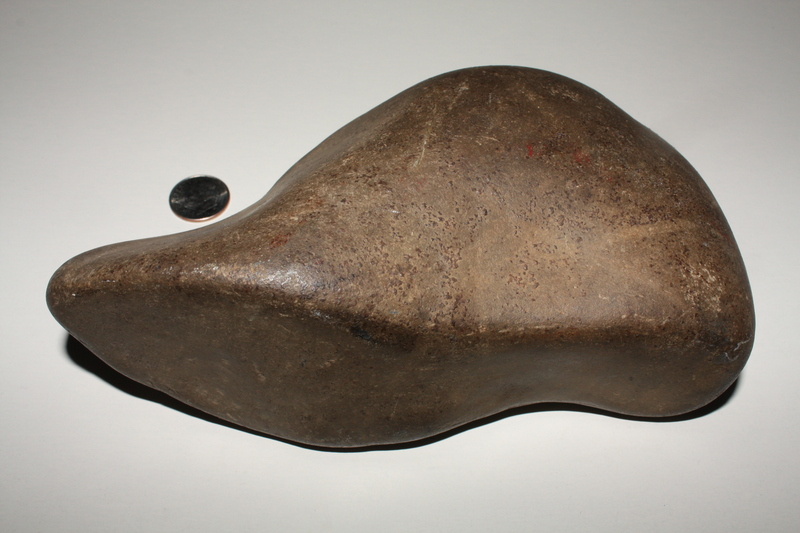 shoe stone from Susquehanna River, Millersburg, PA, bottom side with minimal nodular rock scale. The area circled in red has faint chip marks, presumably indicating human modification. ¶ Firestone et al. 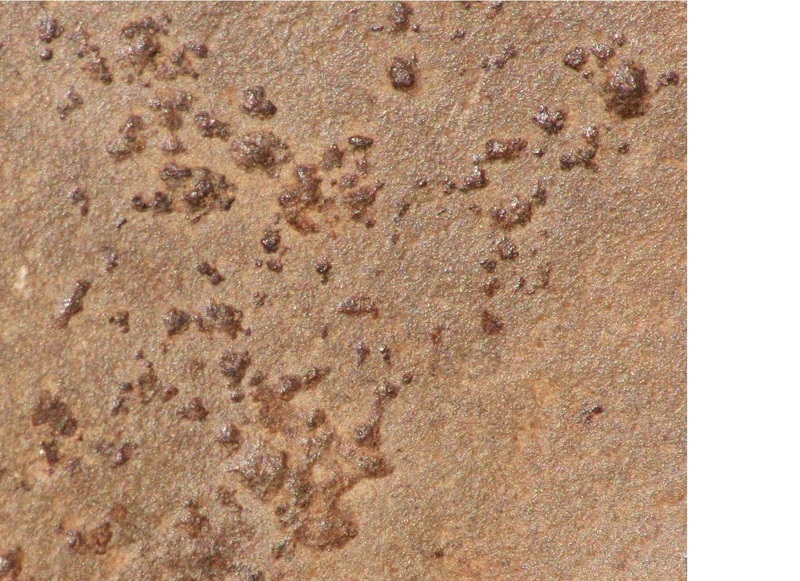 (2006) discovered magnetic spherules embedded in Clovis chert flakes, apparently caused by high-velocity spherule impacts, with attendant particle tracks. Similarly, magnetic spherules with entrance wounds were found in Pleistocene tusk and bone. Since then, these claims have been officially abandoned due to the lack of a realistic origin story for high-velocity ground-level magnetic spherules, and due to early (33 ka) dates for mammoth tusks with embedded spherules, which greatly predate the Younger Dryas. ¶ While a date long before the Younger Dryas can be defended by evoking repeated passage of Earth through the Taurid meteor stream, YD impact skeptics have gleefully ridiculed the suggestion of high-velocity ground-level magnetic spherules, as in the contrarian paper, The Younger Dryas impact hypothesis: A requiem (Nicholas Pinter et al., 2011). And by abandoning this high-energy evidence, YD impact proponents must parry any number of mundane low-energy alternatives for exotic material in black-mats. ¶ But the fact that microspherules can not maintain high velocity in their passage through the atmosphere does not preclude their receiving a fortuitous high-velocity kick near ground level from a sonic-boom shock wave of a bolide meteor passing overhead, or from a local secondary impact of a ballistic iceberg. The sonic-boom shock wave of a super sonic bolide passing would rapidly accelerate and then decelerate particles small enough to be entrained by the shock wave compression. So extraterrestrial microspherules from the Taurid meteor stream freefalling through the atmosphere at a leisurely pace of several km/hr in the immediate vicinity (circa within several meters) of a wooly mammoth might be rapidly accelerated by a powerful sonic boom to speeds approaching that of the Mach 1 shock wave itself, enabling locally-accelerated spherules to penetrate hide, tusk, bone, or even silicates. ¶ An impact origin for Carolina bays requires equivalent inland impacts, which appear to fit with discrete boulder fields composed of well tumbled boulders stacked deep into discrete boulder fields formed by rapid debris flows, which are difficult to explain by a periglacial, freeze-thaw, solifluction gradualism model. 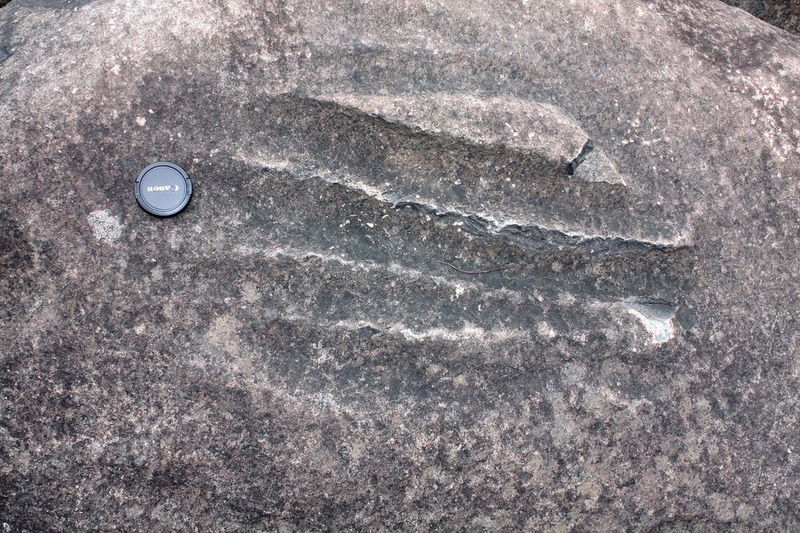 ¶ Deeply-incised surface features, such as cup marks and striations are difficult to impossible to explain away in the context of young boulder fields from the last glacial maximum by the gradualism model, where there’s been insufficient time to blame the effects on weathering. Alternatively, deeply-incised surface features appear to support a ballistic iceberg impact, with surficial scouring by super-high velocity fluids. ¶ The resonant quality of Ringing Rocks diabase boulders can not be explained by the gradualism model, whereas brief exposure to super-high pressures of an impacting ballistic iceberg that prestress diabase boulder surfaces may neatly explain their acoustic properties. ¶ Next, dark-brown, nodular, ferromagnetic rock scale as secondary or tertiary extraterrestrial material splatter from ballistic icebergs contaminated with primary bolide material has no comprehensive alternative explanation. 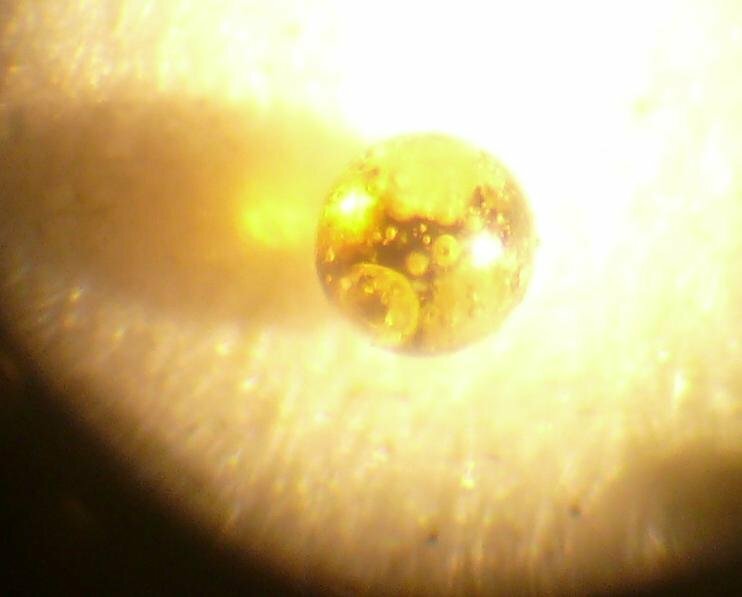 ¶ Finally, microspherules embedded in bone, tusks and archeological chert appear to require a high-energy sonic boom to accelerate exotic magnetic spherules up to penetration velocity, and an extraterrestrial impact could create the necessary sonic boom, as well as exotic magnetic spherules to be accelerated. I am interested in your position on the Nastapoka Arc as impact site. I have compiled an article on the same subject from material on the Web. If you are interested I could E-mail it to you.